Winter has finally come to the NACC region and the much welcome rain has helped trigger the long-awaited beginning of the coastal revegetation season. 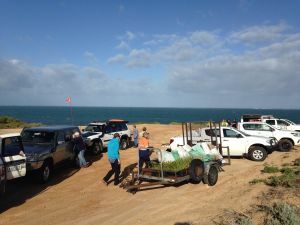 Coastcare groups along the NACC NRM region coastline are swinging into action with many thousands of coastal native plants ready to go in the sand as soon as possible. One of the first groups to spring into action was the Cervantes Primary School who planted a variety of local native seedlings in coastal dunes near the school. This is the third year that students have been involved in local revegetation and the site is looking great. 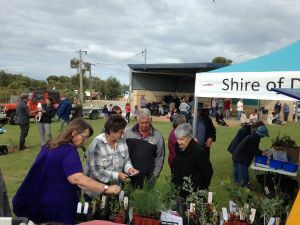 Another active group, the Jurien Bay Regional Herbarium Group, recently hosted a Native Plant Giveaway at Jurien Bay, and will assist NACC with a belated World Environment Day planting event on this Sunday 17 June to restore biodiversity to areas which have had Pyp grass controlled. 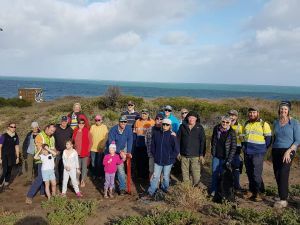 In Guilderton, the Moore Catchment Council partnered with the Guilderton Community Association, NACC, and members of the 4WD Club of WA to complete a four-year revegetation effort in the North Guilderton Dunes. This effort has transformed the area, filling in illegal off-road-vehicle tracks and trapping sand. The Seabird Progress Association are set for their third year of community planting behind the seawall on Saturday 30 June. The previous two years have been very successful and has brought the local community together. 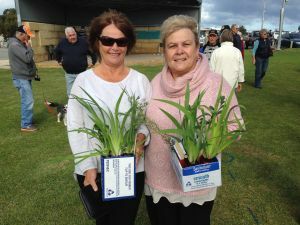 For more information about upcoming coastal planting days, please contact Hamish Longbottom on [email protected] or 0448 459 127. These projects have been supported by the Northern Agricultural Catchments Council through funding from the Australian Government’s National Landcare Program.